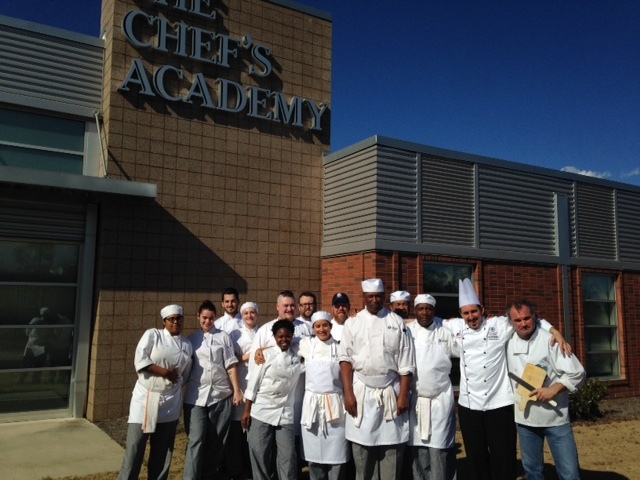 This past month has been pretty exciting here at The Chef’s Academy, NC. It’s been incredible being able to have so many guests come down to visit the school. Having them be able to share their experiences, thoughts, techniques and insight with me and our student’s is invaluable. The International Cuisine’s class is one of my favorite subjects to teach at the school. The Common Roots approach is similar to what I might be able to try to apply in the class room in the way that it’s set up as an exploratory learning method. Since I don’t have first hand knowledge of many of the areas in the world we cover I’m somewhat limited. I can do the best I can of explaining what I do know and covering the information we can find in the text book but if we’re able to hear from people who have experienced these places or have focused their expertise on a subject we’re covering it’s great to be able to learn from them. This term I decided to adjust the syllabus to add a section on African cuisine. Our book mainly focuses on North Africa but I tried to find recipes from other regions to cover as well. I thought it was a great success, the flavors were incredible and I look forward to learning more from the different countries on the continent. It was a pleasure to be able to invite Chef Kabui of Organics and Sound (http://organicsandsound.com/) back to the school for the premier of our African Cuisine class. As a born Kenyan, it was very interesting to hear his input on what we covered in class. We also had opportunity to learn about his most recent farming projects that are in the works and his views on food justice and health education. We then went from Africa to Eastern Europe and Germany. Whenever I teach this class I love to be able to invite Chef Jake Wolf of Capital Club 16 (http://www.capitalclub16.com/Capital_Club_16/Home.html) down for our shared meal during this week. This time he came to the school to show us how to make hand cut Spaetzle, which was an amazing technique. From Eastern Europe and Germany, we then skipped over to China. I had the pleasure of meeting Chef Rodney Ignacio recently and learned about the incredible new project he’s working on as Executive Chef for Brewery Bhavana (http://brewerybhavana.com/) that will be opening soon in downtown Raleigh. Chef Ignacio worked as the Chef for Tao in Vegas most recently and I’m excited to have him here in Raleigh. After hearing about some of the ideas he has for the menu, you should be excited too. I can tell you we are in for quite a surprise. There’s nobody in the Raleigh-Durham area doing dim sum with the level of finesse that they will be bringing to the table. 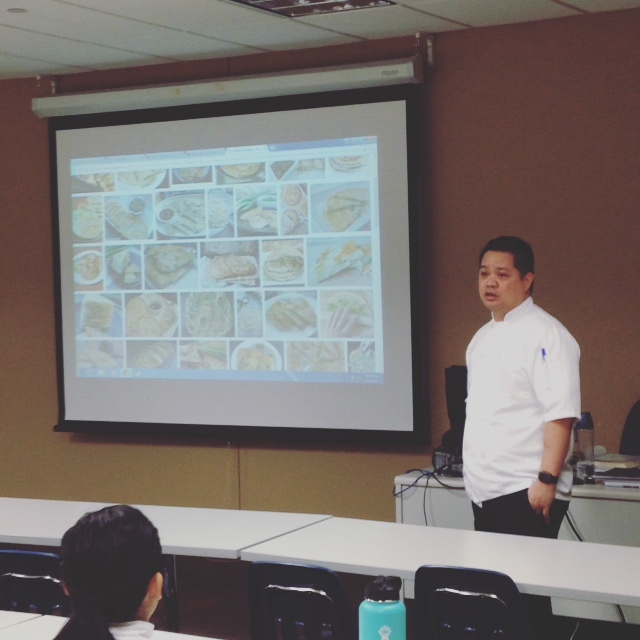 Chef Ignacio was able to speak about his background, the new project and also discussed some typical foods and techniques you may find in Chinese cuisine with our students. From China, we then skipped over to Japan and then S.E. Asia. I try to keep in touch with some of our graduates and saw a post from one of our most recent grad’s, Peter Doucet who’s headed up a Sushi program at Winston’s Grille in Raleigh . 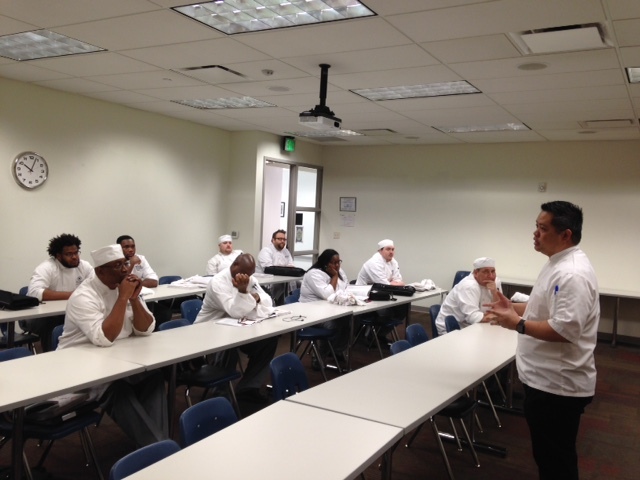 Pete was able to stop by to offer some great tips for us before we attempted to roll our own sushi in class. We don’t cover Korea in our program but with incredible timing, Chef Jameson of Kimbap Cafe (http://www.kimbap-cafe.com/) in Raleigh emailed me asking if there is ever an opportunity for him to come visit and talk with our students. A couple days later he was able to come in and discuss some of the differences you might find in Korean cooking with other Asian cuisines. Jameson also encouraged hands on learning by asking a couple of students to help assist with his demo on Japchae (glass noodle) and Dduckbokgi (spicy rice cakes). It was also pretty interesting to hear about his take on the topic of authenticity. What it means for a Native American who grew up in Korea town, LA to be cooking Korean-fusion inspired food in Raleigh, NC. Kimbap may not cook what you might think of as traditional Korean cuisine but don’t let that stop you from trying their amazingly delicious Korean inspired fusion dishes because you’d be really missing out on something spectacular. The Common Roots Project has been on my back burner at a slow simmer for many years now. The basic premise of it has stayed the same through its many re-mixes which is to Cultivate Wholistic Nourishment. If we begin our process of creation and growth (Cultivate) by looking inward, then gradually working out while considering the effects that this has on the whole (Wholistic). Then considering how it is that this may be beneficial to our collective souls (Nourishment) we may possibly be able to tap into our true Common Roots. When thinking about our basic mission and how to apply it towards the project, it always will boil down to the one key ingredient which is community cooperation unless of course you live as a hermit in a far away secluded place. Participation from you is encouraged and crucial to our growth. With so much misinformation in the media and our social networks nowadays there’s no better time than now to help us grow our cause. To push unity, to build community, to learn from one another about what makes us special and unique. To share. To find. To Explore.